FAIRFIELD, N.J. (April 26, 2016) — May is Trauma Awareness Month and the American Red Cross urges eligible donors to give blood or platelets to help ensure lifesaving blood products are available for trauma patients and others with serious medical needs. The Red Cross provides blood to approximately 2,600 hospitals nationwide, including 100 throughout the Penn-Jersey Region footprint. Donated blood helped save seven-year-old Ally Turner in December after a tragic accident at her home in Abington Township, Pennsylvania. Ally sustained a traumatic brain injury after a fall in bathtub. Her parents, Brad and Bridget, immediately began to perform CPR, which saved Ally’s life. Once she was in the hospital, to help preserve brain function and allow Ally’s lungs to heal, she was placed on a ventilator and put into a medically induced coma. 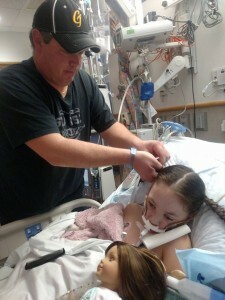 To let her lungs relax, Ally was also placed on an Extracorporeal Membrane Oxygenation or ECMO machine used to take the blood out of her body, give it oxygen and send it back into her body. Being on this machine for seven days required several blood transfusions. As Brad and Bridget continue to help Ally fight each day, their hope is to raise awareness for CPR training and blood donations. They want to ensure that their tragedy encourages others to help save lives.